“Plant a seed!” is the first way many people think of as a way to start a new fruit tree. For many types of fruits, seed planting works well, while for other species, it doesn’t give as good results. And sometimes it can give you a lot of surprises – which can be good or bad, depending on your needs. Even for the fruits where seed planting works well, knowing a few things can make the difference between a successful and unsuccessful planting. This article is to help beginners figure out whether planting seeds is the right method, or whether another method is better for the fruit species you want to propagate. Does this fruit species come true from seed? Some fruit tree species produce seedlings that are virtually identical to the parent tree, including producing fruits that are the same as the one the parent tree made. Some produce seedling trees that aren’t exactly identical to the parent, they can be generally good enough quality to be worth planting. Do seed-grown trees of this species start producing fruit in a reasonable number of years after planting? Some seed-grown fruit tree species can take a ridiculously long time, years and years, before they start making fruits. This is called a juvenile period. Many types of citrus are notorious for a very long juvenile period – you can wait a decade or more for a seed-grown citrus tree to start producing fruits. (That’s one reason why people usually start citrus trees by grafting.) 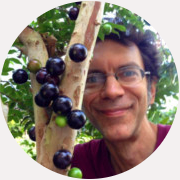 Note: some fruit species, like jaboticaba, are just slow-growing, and they’ll take about a decade to start producing fruit, whether you start them from seeds or cuttings or grafting. That’s not juvenility so much as it is just being slow to grow big enough to start producing fruit. Could the good-fruited female parent have been pollinated by a much worse quality nearby tree of the same species? Where I live in North Florida, there aren’t any wild papayas, and very few papaya plants in general. So around here, we can plant out good varieties of papayas, save seed from them, and grow that seed into more excellent-fruited papaya plants. In South Florida, there are populations of wild papayas, some of which have fruits so nasty the locals call them ‘monkey vomit papayas’. If you are save seed from an excellent papaya grown in South Florida, and if that plant grew next to forest full of wild papayas, there’s a good chance the resulting plants will have been contaminated with ‘monkey vomit’ genes. Yuck! Do the seeds need to planted right away, or is it OK to let them dry out and plant them later? Some fruits have seeds that you can treat like tomato seeds: dry them out, store them in a jar, and plant months or even years later. Papaya seeds are like that – which is why papayas spread centuries ago from their homeland in Central America to every tropical region of the world. Back in the days of sailing ships, a few dry papaya seeds in a sailor’s pocket could handle the months-long journey across the vast oceans to the next tropical country. Many fruits, on the other hand, have seeds that need to be planted within a few days of when you extract them from the fruit. The motto for these seeds is, ‘if they dry, they die.’ Mango, jackfruit, avocado, durian, jackfruit, and mangosteen are examples of these types of seeds. Mangosteen is an extreme example of this phenomenon, with seeds that decline at lightning speed if not planted immediately. 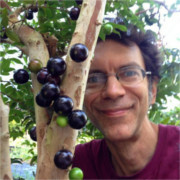 A few years ago, a fruit enthusiast here in Florida named Ed Kraujalis wanted to distribute mangosteen seeds to his fellow U.S. fruit growers, so he made a special arrangement: a mangosteen grower in Singapore extracted seeds from a huge quantity of mangosteens, then immediately sent the seeds overnight express around the world to Ed in Florida. Once Ed received the package, he stayed up all night repackaging the seeds for all the people in the U.S. who had placed orders, and in the morning he sent them out overnight express to their final destinations. Those mangosteen seeds went from the inside of a fruit in Singapore to people’s door steps in the U.S. in less than 48 hours. That’s the kind of extreme measures needed for some fruit tree seeds. The technical terms for these two types of seeds are ‘orthodox’, for seeds that can withstand long-term dry storage, and ‘recalcitrant’, for seeds that need to be planted immediately. This one single fact about seed biology is a big reason why mangosteen, hugely popular in its native region in Southeast Asia, is little-known in other tropical areas, while papaya, native to Central America, is grown and loved around the world. Do the seeds need any special treatments to germinate? Some seeds from areas with cold winters need a simulated winter before they’ll germinate. This is called cold-stratification, and an easy way to do it is to put the seeds in a bag of damp (not soggy wet) soil, and put them in a refrigerator for a few weeks or months. Some seeds are adapted to being eaten by animals, and need a simulation of various aspects of this process. Some seeds, like carob, need their surface shell scratched up (simulating being chewed on) before they can easily absorb water and germinate. This is called scarification. Some seeds need various other treatments, like a brief hot water bath, or a dip in acid, to enhance germination.